One month before the U.S. presidential election Republican challenger Mitt Romney is attacking President Barack Obama's leadership around the world. 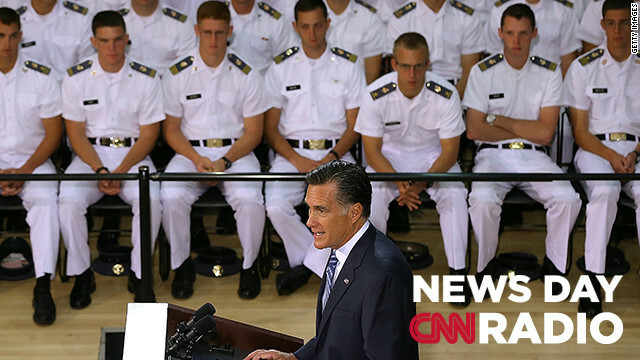 In what was billed as a major foreign policy speech, Romney condemned Mr. Obama for "leading from behind," saying he's weakened U.S. influence. Romney called for a firmer line towards Iran. [2:07] “ I will not hesitate to impose new sanctions on Iran, and will tighten the sanctions we currently have." [7:57] "Child molesters really are hated by their fellow inmates. And, truth be told, by the officers as well." [13:35] "Americans like seeing presidents and former presidents work together. They like seeing presidents from different parties put aside their differences to get something done... And so I think that there is a sense of putting the good of the country first."